From Novice to Expert, Ric’s Wine Market Has an Event for Everyone. “An educated customer demands more” is not just a catchphrase for us; we consider it a part of the foundation of our success. When you learn more about wine it makes you more selective about what you choose to drink. Once you learn the difference between small production artisan wine making versus factory made you will never go back to buying your wine from a wall in a grocery store or from unknowledgeable staff. And the best part is you often pay less for wine from a small producer because they don’t have the expense of a marketing team that has to sell the wine on merits other than quality. We pride ourselves in doing the ground work in finding these artisan wine makers and sharing their stories and their wines with you. Our education programs are a mix of good fun and education. We can conduct a simple tasting in your home or at our shop. 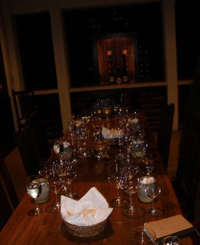 We often have visiting wine makers or representatives from the winery come in our shop and offer and tasting classes. For sit down events we require our instructors to have passed the Certified Specialist of Wine exam through the Society of Wine Educators. These classes focus on specific regions, grapes or other themes. Our open-house tastings also usually follow a theme but are standup, casual affairs, where you walk between pouring stations and the education is less formal. In both cases we typically sample several wines depending on the theme and price. All of our programs require prepaid reservations although we do allow for cancellations up to 48 hours prior to the event. Most programs last two hours and the prices are listed per class. Unless stated otherwise, cheese and bread are provided as part of the price. Classes do fill up fast and many are limited to a specific number of guests. You should make your reservation earlier to insure your place.